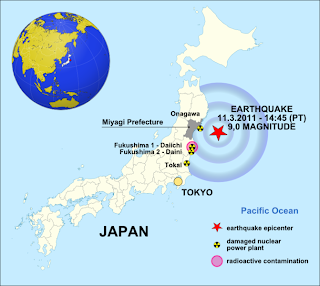 The 2011 Tohoku earthquake and tsunam was caused by a 9.0-magnitude earthquake off the coast of Japan that occurred at 14:46 JST on Friday, 11 March, 2011. 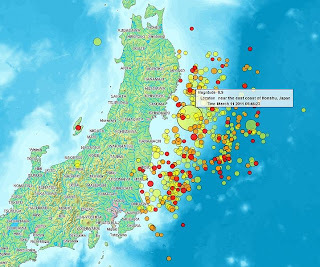 The earthquake triggered extremely destructive tsunami waves of up to 30 m (98 ft) that struck Japan minutes after the quake, in some cases traveling up to 10 km (6 mi) inland, with smaller waves reaching many other countries after several hours. The nearest major city to the quake was Sendai, Honshu, Japan, 130 km (81 mi) away. The quake occurred 373 km (232 mi) from Tokyo. The main earthquake was preceded by a number of large foreshocks, and multiple aftershocks were reported afterwards. The first major foreshock was a 7.2 MW event on 9 March, approximately 40 km (25 mi) from the location of the 11 March quake, with another three on the same day in excess of 6.0 MW. Following the quake, a 7.0 MW aftershock was reported at 15:06 JST, followed by a 7.4 at 15:15 JST and a 7.2 at 15:26 JST. Over six hundred aftershocks of magnitude 4.5 or greater have occurred since the initial quake. The actual height predicted varied, the greatest being for Miyagi at 10 m (33 ft) high. The tsunami inundated a total area of approximately 470 square kilometers in Japan. The earthquake took place at 14:46 JST around 67 km (42 mi) from the nearest point on Japan's coastline, and initial estimates indicated the tsunami would have taken 10 to 30 minutes to reach the areas first affected, and then areas further north and south based on the geography of the coastline. Just over an hour after the earthquake at 15:55 JST, a tsunami was observed flooding Sendai Airport, which is located near the coast of Miyagi Prefecture, with waves sweeping away cars and planes and flooding various buildings as they traveled inland. The impact of the tsunami in and around Sendai Airport was filmed by an NHK News helicopter, showing a number of vehicles on local roads trying to escape the approaching wave and being engulfed by it. A 4-meter (13 ft)-high tsunami hit Iwate Prefecture. Wakabayashi Ward in Sendai was also particularly hard hit. The Fukushima I nuclear accidents are a series of ongoing equipment failures and releases of radioactive materials at the Fukushima I Nuclear Power Plant, following the earthquake and tsunami. 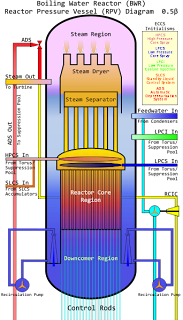 The plant comprises six separate boiling water reactors maintained by the Tokyo Electric Power Company (TEPCO). 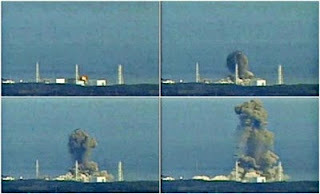 Reactors 4, 5 and 6 had been shut down prior to the earthquake for planned maintenance. The remaining reactors were shut down automatically after the earthquake, but the subsequent 14 metres (46 ft) tsunami flooded the plant, knocking out emergency generators needed to run pumps which cool and control the reactors. The flooding and earthquake damage prevented assistance being brought from elsewhere. 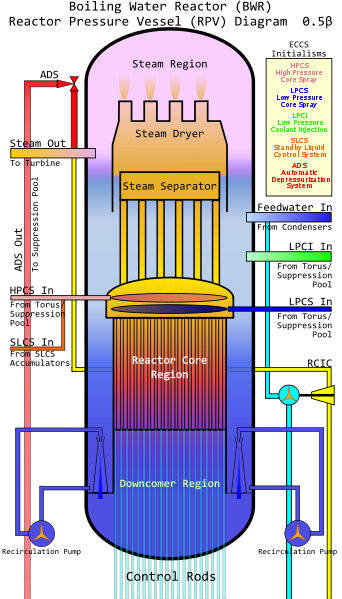 Evidence arose of partial core meltdown in reactors 1, 2, and 3; hydrogen explosions destroyed the upper cladding of the buildings housing reactors 1, 3, and 4; an explosion damaged the containment inside reactor 2; and multiple fires broke out at reactor 4. In addition, spent fuel rods stored in spent fuel pools of units 1–4 began to overheat as water levels in the pools dropped. Fears of radiation leaks led to a 20 kilometres (12 mi) radius evacuation around the plant. Workers at the plant suffered radiation exposure and were temporarily evacuated at various times. 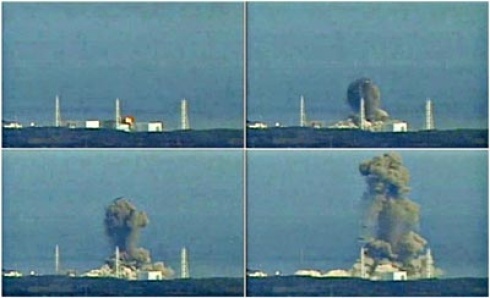 On 18 March, Japanese officials designated the magnitude of the danger at reactors 1, 2 and 3 at level 5 on the 7 point International Nuclear Event Scale (INES). Power was restored to parts of the plant from 20 March, but machinery damaged by floods, fires and explosions remained inoperable. The latest confirmed toll to date are over 10,000 deaths with 16,361 people missing across eighteen prefectures. These numbers are expected to increase, with casualties estimated to reach tens of thousands. Prefectural officials and the Kyodo News Agency, quoting local officials, said that 9,500 people from Minamisanriku in Miyagi Prefecture—about a half of the town's population—were unaccounted for. NHK has reported that the death toll in Iwate Prefecture alone may reach 10,000. Save the Children reports that as many as 100,000 children have been uprooted from their homes, some of whom were separated from their families because the earthquake occurred during the school day. On 14 March, Kyodo News Agency reported that some 2,000 bodies were found on two shores in Miyagi Prefecture. It was reported that four passenger trains containing an unknown number of passengers disappeared in a coastal area during the tsunami. The earthquake caused a large number of displaced people. The number of the evacuees has once passed 300,000. Some earthquake survivors died in the shelters or in the process of evacuation. Many shelters struggle to feed evacuees and are not medically sufficiently equipped. Fuel shortages hampered relief actions. In the first week after the earthquake, supplies of food, water, and medicine had been held up because of a fuel shortage and the weather condition. There is a need for temporary housing, as the Japanese government are trying to remove evacuees from large shelters, where there have been reports of poor sanitary conditions. As of late March, 8,800 temporary units were planned in Iwate, 10,000 in Miyagi, and 19,000 in Fukushima. The nuclear crisis and recover continues unabated. The Japanese people remain otherwise calm and stoic about the ongoing situation, the disaster across of the Northeastern region of Tohoku, and the overall future of Japan.